Using data collected from 18 chimpanzee research sites, a newly published study shows that chimps engage in violent and sometimes lethal behavior regardless of human effects on local ecology. For decades, scientists studying chimpanzees in the wild have noted the ways our closest relatives are similar to humans — they form tightly knit social groups, engage in play, and use tools in their day-to-day lives. A new study shows that chimpanzees are like humans in another important way — their natural capacity for violence. Data collected from 18 chimpanzee research sites and four focused on bonobos show not only that the two groups are different, but that chimps engage in violent and sometimes lethal behavior regardless of human effects on local ecology. The study is described in a September 18 paper in Nature. The conclusion, Wrangham said, comes after several years of collecting information on virtually every incident of violence at the African research sites. 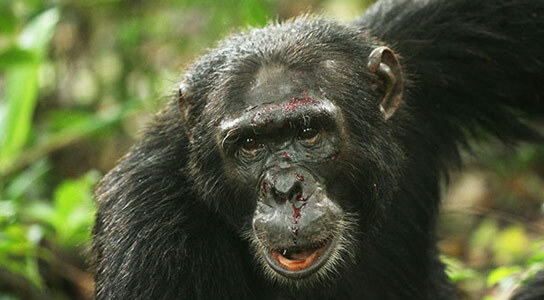 The hope, Wrangham said, is that the study will settle the long-simmering debate about violence in chimpanzee society. Though most researchers now accept that violence among chimps is a regular occurrence, when the first reports emerged in the early 1970s, the notion that chimps were capable of such aggression caused shockwaves in the scientific community. To this day, Wrangham said, a small but vocal opposition has claimed that such attacks result solely from human impacts. If the new study is the most definitive rejection of the “human impacts” argument, is there another explanation for lethal violence in chimp society? The theory advanced by Wrangham and colleagues, dubbed “adaptive strategies,” suggests that chimps and bonobos followed starkly different evolutionary pathways, with evolution among chimpanzees favoring the capacity to kill. “This is speculative, but what I have suggested is that the absence of gorillas on the left bank of the Congo River, where bonobos live, has changed the ecology there such that bonobos are able to combine the feeding strategies of chimpanzees with the feeding strategies of gorillas,” he said. “That is a plausible explanation for the critical observation that bonobos live in more stable groups than chimpanzees do. Stable groups are associated with reduced violence. Ultimately, in stable groups victims have more defenders, so aggressors are less likely to be able to bully others without penalty. In shedding light on violence among chimps, the study also may offer insight in the same tendencies in humans. Be the first to comment on "Chimps Engage in Violent Behavior Regardless of Human Effects on Local Ecology"